The Deformer system included in the Gizmo 3D is a series of tools which can apply a global or local deformation to your current SubTool, depending on whether it is masked. The deformers will let you bend, twist, subdivide, smooth and a lot more. All of the deformers are interactive, making this a great way to visually edit your models. The Deformers, located at the top of the Gizmo 3D Customize menu. The Deformers will only work with models that don’t have subdivision levels. If your current SubTool has multiple levels of subdivision, click the Delete Higher/Lower func­tions located in the Tool >> Geometry sub-palette. The Deformers are located in the Gizmo 3D popup palette, accessed by clicking the Customize icon. At the top of the Gizmo 3D, click the small gear “Customize” icon. A popup menu will open. The bottom part lists the different deformers that are available. Chose the deformer of your choice. A series of manipulators represented by cones associated with a bounding box will appear. When hovering over a manipulator, a description of the function is displayed. Adjust the manipulators by clicking and dragging the circle part of the cones to apply a transformation to your model. If you wish to reset your current modifier, click again on the Customize (gear) icon and select the corresponding action in the popup menu. When finished with the deformer, switch to Draw mode or return to the Custom­ize menu to click Accept. You may also use the Customize menu to click the Gizmo 3D function to revert to the manipulator or select another manipulator. Find below the list of the deformers found in the Gizmo 3D. Some of them simply apply a deformation to the current model while others may apply topology modifications like adding edge loops or more drastic changes. The Bend Arc deformer bends the current SubTool along an arc (part of a circle). The arc center is defined by one side of the bounding box and each side of the bounding box can generate its own arc, producing a bend with multiple angles. From left to right: the original model, the Bend Arc applied on one axis, then on two axes. Radius: Defines the radius of the arc circle. Twist: Performs a rotation of the model around the arc. Angle: Defines the angle of the arc from 0° (horizontal) to 180° (a vertical angle). The Bend Curve deformer bends the current SubTool along a curve which can be modified through control points. The density of the control curve and the associated control points can be interactively modified as well as their positions in space, which will apply the corresponding deformation to the active selection. Each control point can receive extra deformation for precise control. On the left, a simple tube with the BendCurve deformer applied and associated with 4 control points. On the right, all the points have been moved to completely change the shape of the tube. Curve Resolution: Defines the number of control points on the curve. Smoothness: Allows the line to be more rounded or angular. Axis: Defines the axis of the bounding box on which the curve will be used (X, Y or Z). Symmetrical: Sets a symmetry on the curve itself, where control points located on each side of the curve will receive the same transformation. Smooth: Applies smoothing to the control curve. This can be useful if your modification has too strong of an effect on your deformation. Twist (on control points): Applies a twisting around the curve at the point location. Scale (on control points): Applies a scaling deformation at the point location. Squeeze (on control points): Applies a non-uniform scaling deformation at the point location where a value below 1 will squash the model and above 1 will stretch it. This deformer display a deformation cage on the SubTool. 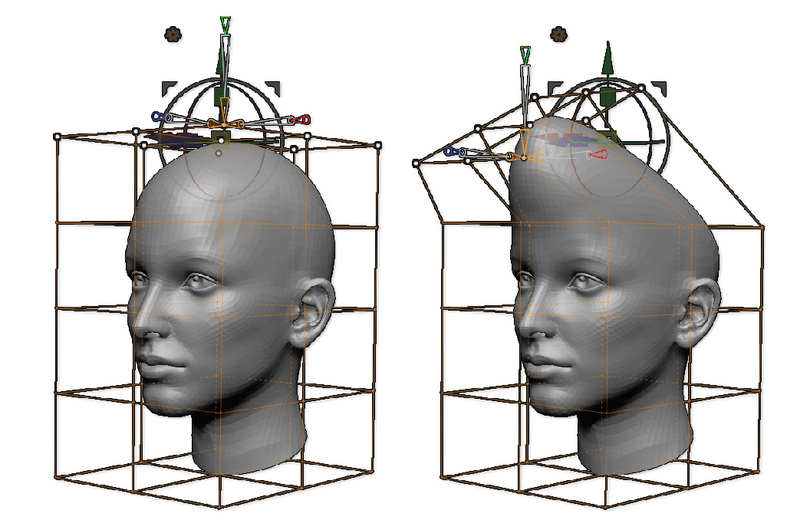 By deforming and ma­nipulating the cage points, you will apply the corresponding deformation to your model. This is also referred to as FFD for Free Form Deformation. To manipulate a single point, you can simply click and drag on the point to move it across the screen working plane. You can also select a single or multiple points at the same time by clicking once on a control point. It will turn to a white dot. To add or remove other points, press the Shift key while clicking on new points. These points can be manipulated by the Gizmo 3D for both Move, Scale and Rotate operations. 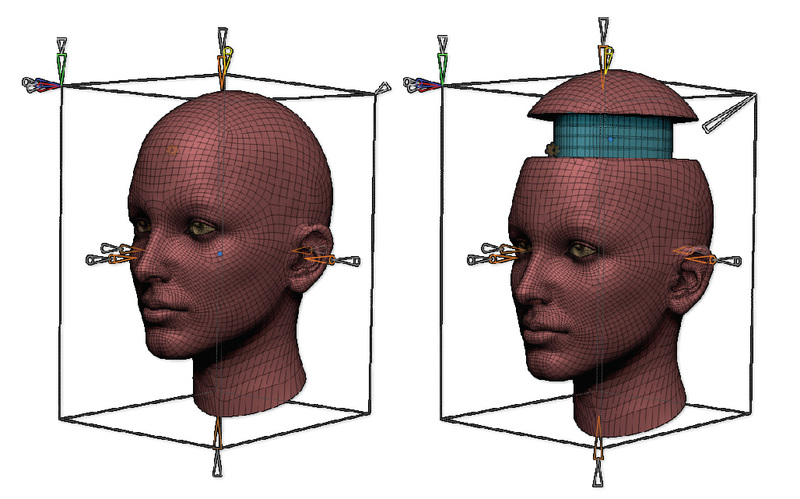 On the left, the Deformer applied to the head with the top point selected. On the right, the Gizmo 3D has been used to scale down and rotate these points, applying a soft and local deformation which would have been difficult to do with the classic sculpting tools in ZBrush. X, Y and Z Divide: Defines the definition of the cage. More control points mean more accuracy in a local area, while fewer points work better for global deformation. X, Y and Z Symmetry: Sets the symmetry plane for the deformation. This symmetry, like that found in the Transform palette, can be parallel or mirror type (regular symmetry). The Extender deformer by default inserts a loop of polygons along the bounding box axis of your choice. 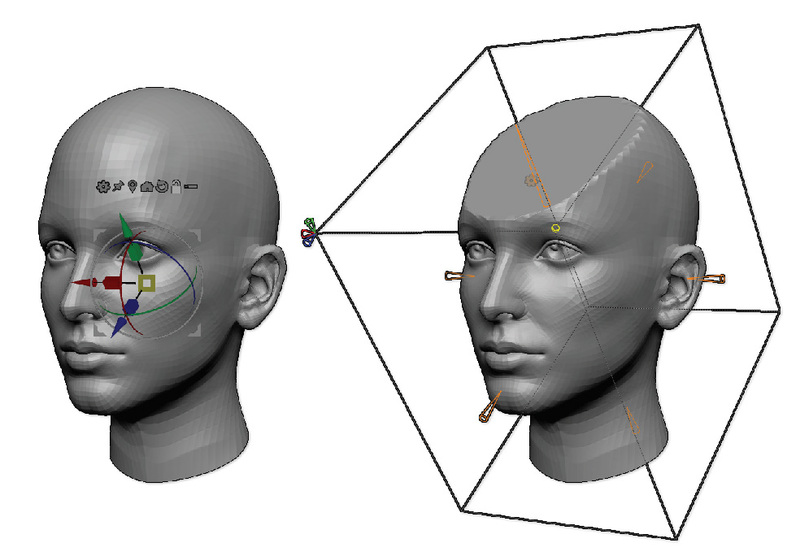 This loop of polygons can be divided and moved along the model by dragging its associated dot. It can also be applied to multiple axes at the same time. This deformer is a great way to quickly create advanced primitives for creating “kit bashed” style models. The Extender part has been added to the top of the head. The Inflate cone has then been manipulated to do a negative extrusion. Extender: Defines the inserted loop size along the associated bounding box side. Size (X, Y and Z): Defines the size (scale) of the deformation on the side of the manipulator. Symmetry (X, Y and Z): Allows the Extender deformation to be applied symmetrically. Resolution: Adds multiple edge loops inside the inserted loop of the Extender. Apply Creasing: Adds a crease to the border of the Extender. Inflate: Applies an inflate on the Extender area, creating thickness which can be positive or negative. The Flatten deformer clips the current selection based on the planes of the deformer bounding box. Please note that the polygons of your selection won’t be removed or sliced. They are simply flattened on top of each other, similarly to the Clip Brush. On the left, the original mesh, with the Gizmo 3D rotated. 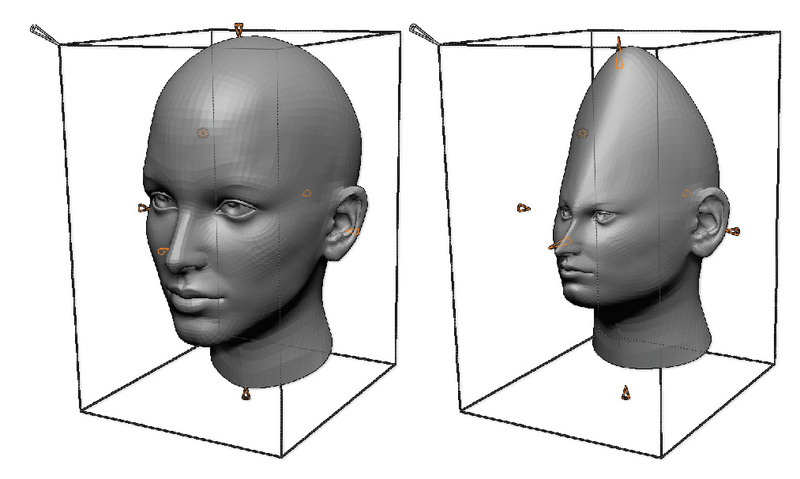 On the right, notice that the deformation box has been oriented with the same angle as the Gizmo 3D, then the Flatten deofrmation has been applied to the top part. Flatten: Defines the depth of the deformation along the corresponding working plane. Slice Topology: Adds an creased edge loop around the flattened area of the selection. This option will drastically improve the results of the Flatten deformation when used in combination with Dynamic Subdivision. The Multi Slice deformer inserts one or more edge loops along the X, Y and/or Z axis. These edge loops do not follow the existing flow of the topology, instead slicing the way around the model. The transformation can be freely moved across the model by clicking and dragging the blue dot located at the center of the modified topology. The width of each modified area can be interactively modified as well. On the left, the original mesh. In the center, Multislice was used to insert multiple edge loops in the center on the model. On the right, the blue dot manipulator has been moved up to set another location for the slices. X, Y and Z Resolution: Defines the number of slices to insert in the area of transformation. Slice Width (per axis): Defines the width of the Multi Slice insertion area. Apply Creasing: Applies an edge crease to all slices inserted in the model. The Taper deformer applies the corresponding deformation to the mesh. On the left, the original mesh. 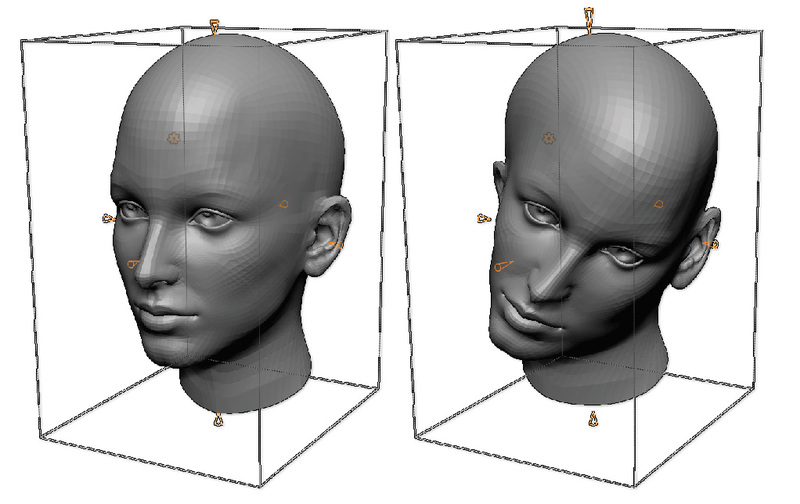 On the right, the model was transformed with the Taper modifier. Taper: Defines the strength of the deformation as well as its direction, from start to end or vice versa. Exponent: Allows the Taper effect to be more rounded at either the start or end of the deformation. The Twist modifier applies a twisting effect around the selected axis. On the left, the original mesh. On the right, a two axis twist has been applied on the model. Twist: Defines the rotation angle of the twisting effect along the selected axis. Read about the 2018 Deformers here.